Is there a page on which I can view all Sitecore jobs running? Is there an admin page in Sitecore which shows all jobs running and all the information such as current state, name, category, etc? 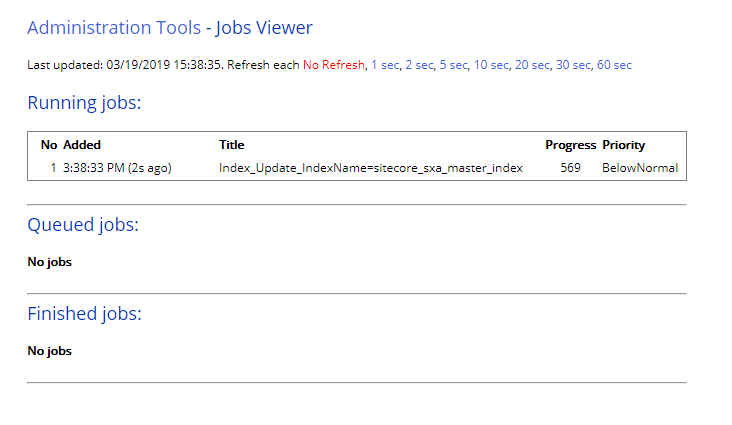 I used to use the Sitecore Rocks - Job Viewer but was wondering if there is such thing embedded directly on the product. Not sure if it does exactly the same as Rocks but it's a start. Not the answer you're looking for? Browse other questions tagged admin-pages scheduler-job or ask your own question.